Pigs in a blanket are, undoubtedly, an American favorite. Made from hot dogs and flaky biscuit dough, these are front runners for picnics, birthday parties and even weeknight dinners! However delicious and kid-friendly these may be, they aren't the healthiest choice out there. So instead of banning these from your dinner table, lighten them up with this recipe, using 98 percent fat-free turkey dogs and low-sodium cheese! Your kids (and picky husband) won't even know the difference! Just how healthy are these? 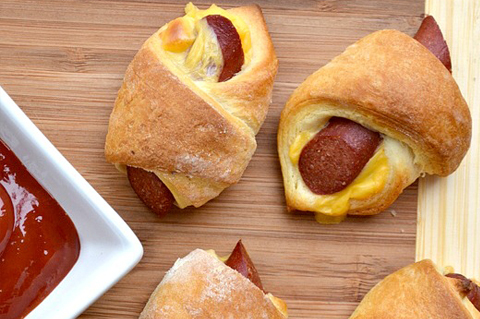 Two of these cheesy, hearty pigs in a blanket have only 6.5 grams of fat! Plus, the turkey dogs give you 11 grams of protein! Not only will this fill you up quicker, it'll work to build lean muscle! In addition to being healthy, these are very easy and can be made in less than 25 minutes (and require just 3 ingredients). Preheat oven to 425 degrees F. Grease a baking sheet liberally with cooking spray. Cut dough vertically into 4 rectangles. Then cut those rectangles in half (horizontally) and then cut those rectangles diagonally (into triangles). Cut cheese into 6 bite size chunks. Place cheese on the wider inside of the dough. Place a sliced hot dog on top of the cheese and roll dough up so it forms a crescent. Repeat until all ingredients have been used. Bake for at least 10 minutes, or until crescents are golden brown. Serve with ketchup or your favorite dipping sauce and enjoy!